One of the hottest trends in scrapbooking and paper crafting right now is the Travelers Journal. If you have been watching YouTube videos on this amazing project and wanting to make your own, this workshop is for you. 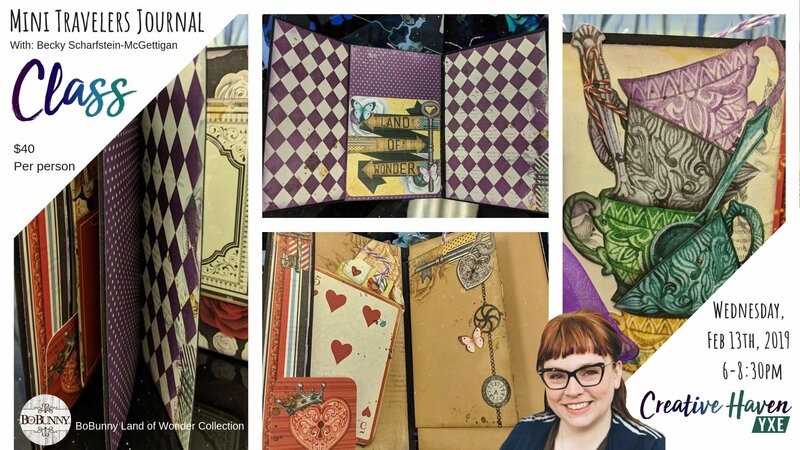 In this workshop Becky will teach you how to make your own travelers journal from scratch. We will be using the BoBunny Land of Wonder paper line. This class is open to everyone from the beginner paper crafter to the experienced scrapbooker. Becky will teach you how to create the base of this journal, add pockets, create tags and so much more. These journals are addictive and once you have the basics down the possibilities are endless. Space is limited so book early online, in-store or call 306-880-4888.